In a high school classroom the teacher is giving a lesson about the Jewish holiday of Hanukkah. Several children question why they should learn about this holiday, as they aren’t Jewish, and the teacher explains that even though they come from different backgrounds, they can benefit (Look Around You). She explains that the holiday celebrates a miraculous event (What is a Miracle?). The Jewish Temple, desecrated by the enemy was rebuilt and oil lamps for the dedication ceremony burned for eight days even though there was only enough oil for one (Eight Full Days of Oil). The students learn the Hanukkah prayer for lighting the lights, how to play a game called Dreidel, and the typical Hanukkah foods eaten during the holiday. Together they all build a giant Menorah. Eli is a boy in the class who is bullied by his classmates. The children tease him and because he cannot carry a tune, the teacher asks him to mouth the words while the other children sing. He is embarrassed and humiliated, and does not participate in the songs or games or in building the Menorah. After the class leaves for recess, he stays behind and questions why he can’t find his voice, asking for help (Help Me Find My Voice). He becomes agitated and inadvertently knocks over the Menorah which crashes to the floor and breaks. Frightened by what he has done, he rushes out of the classroom. Abby, another class member, is the first to return and sees the broken Menorah. She is upset and wonders why anyone would want to destroy it (Defy the Darkness). Eli returns and waits outside the classroom door, hearing Abby’s lament. He enters the classroom and she shares her grief with him (You Are My Friend). Eli confesses that he did not participate in building it. Abby assures him that as a member of the class, he is also included and is her friend. Eli gratefully accepts her friendship, eager to be accepted. Gradually the class members enter, each one viewing the broken Menorah with dismay (How Did Our Menorah Fall?). The teacher returns and seeing how upset the children are, she encourages them to help rebuild the Menorah, drawing a parallel with the rebuilding of the temple in the Hanukkah story (If They Did It, We Can Do It). The children work together and when the Menorah is repaired, they form a circle around it and sing (Let’s Hold Hands). At first Eli is hesitant to join in the song, but Abby gives him the courage to try, and when he does, everyone is astonished to hear that he has a beautiful voice (It’s a Miracle!). 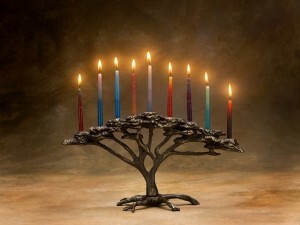 They celebrate by all joining hands and dancing and singing around the Menorah, which suddenly and spontaneously bursts into a brilliant light, creating the second miracle.